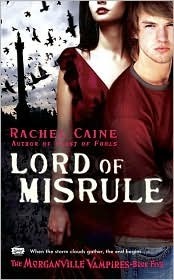 I say this every time about the Morganville Vampire books, but it's true: Rachel Caine has yet to disappoint me. Lord of Misrule is the 5th book in this series, and it's still as action packed and full of intrigue and suspense as the first book. I don't know how Rachel does it, but she manages to pack quite the punch is such a small little book. Everything is basically in chaos in Lord of Misrule. Bishop is still in power, there are rebellions springing up, and a hurricane is steadily making its way towards Morganville. Claire, Shane, Michael and Eve are all caught in the middle, and are being used as pawn pieces in a greater game between Amelie and Bishop, the winner of which could determine life or death for the town. Rachel's writing style stays consistent with the first 4 books, and the action is never lacking. There are, as always, some very steamy scenes between Shane and Claire (which I loved). I definitely, definitely recommend you pick up Lord of Misrule if you haven't yet. 4 out of 5 stars. I really want to try some paranormal YA books. That's a genre I would like to explore. Great review!